Al Rebo was an imaginary student friend Neil fabricated, based upon a guy he and Dahmer met at tennis camp at the University of Michigan during the summer of 1976, between our sophomore and junior years. Dahmer was a fair tennis player and had been on the tennis team in junior high a couple years earlier. When we got to high school, Dahmer dropped tennis like he dropped every other extra curricular activity, as the voices and compulsions methodically began to take over and he lost interest in everything but his fantasies. But his Dad, Lionel, also a regular tennis player, pushed him to continue. I suspect Jeff had no personal motivation to play tennis, but went along with it just to get his Dad to stop nagging him. It was a two week camp. Neil and Jeff actually roomed together! Neil reports that "nothing really happened (of note), except that I realized that he was at a much more serious threshold of strange than the rest of us." The campers were housed on the campus of a nearby Lutheran Junior College and had no supervision to speak of and were free to hang out wherever they wanted in their free time. No one had cars, so it had to be within walking distance. There was a pizza parlor near campus managed by a guy called "Rebo." This was a nickname of some unknown origin, but the sound of it greatly amused Jeff. He would call out to him in his spaz voice...."Reeebooooo", similar to his famous taunting of the school librarian "Miss-uuuuuus Wood-aaaaaaaard!" A few weeks later, school started up again. Neil, for reasons he can't recall, stuck an "Al" on the front of "Rebo" and began treating him as an imaginary student. The rest of the Dahmer Fan Club quickly joined in. We started slipping Rebo into morning announcements and newspaper articles. "Would Al Rebo please report to the office." We started fake rumors about Rebo to observe how quickly they spread about school. We listed him in band concert programs and club meetings. 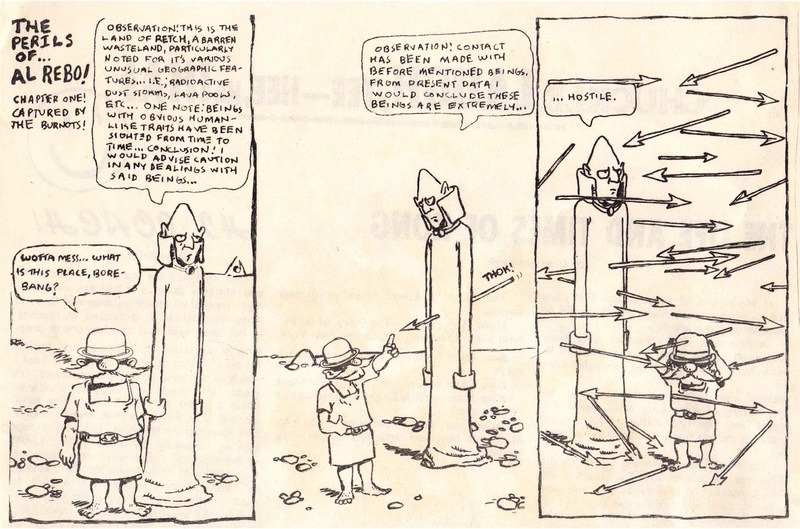 I teamed up with friend Tubbs and created a nonsensical Adventures of Al Rebo comic strip for the school paper (below). Dahmer, however, didn't really take part in the fun. He had reached the tipping point. The nightmare visions that swirled in his head had become so powerful that he took to the bottle a week or two into the school year. From that point on, he was drunk every day. It was that sudden. He went from merely strange, to dark and scary in a matter of weeks. 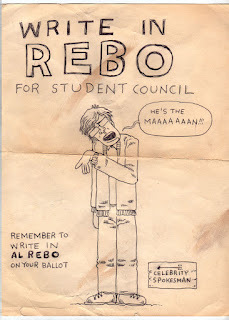 The peak of our Rebo silliness was the Student Council elections at the start of senior year in fall 1977. We registered Al Rebo as a candidate for council, easily gathering the 50 or so signatures required. 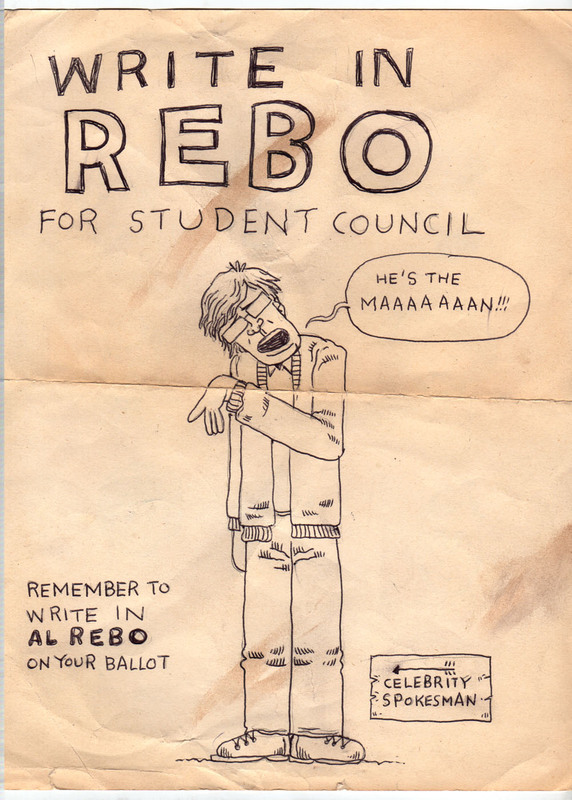 I churned out a number of large "Rebo for Student Council" posters, most featuring my cartoon Dahmer as a "celebrity spokesman," and plastered school hallways with them. I remember Dahmer walking up to one and bellowing out "REE-BOOOOOOOO" and laughing. School officials then caught on to us. Rebo was struck from the ballot and my posters removed. Outraged at this undemocratic show of authoritarianism, the Dahmer Fan Club swung into action. We started a "Write In Rebo" campaign. I drew some more posters, but these were torn down as soon as they were hung, by miffed (legitimate) student council types, who were none to pleased with us for sabotaging their election. So I drew the flyer below. Friend Tubbs and I snuck into the mimeograph room after school and ran off a couple hundred copies. 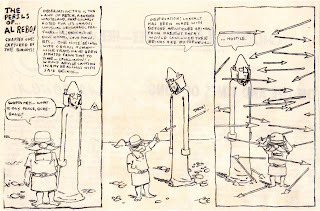 Mimeographs were the precursor to Xerox copy machines. Schools used them to make copies of tests, handouts and newsletters. The ink was always bright blue for some reason and had a very strong and distinctive chemical smell, even when dry. The stoners used to push mimeographed handouts close to their faces and take a big whiff. The morning of the election, Tubbs and I came early and each manned one the school entrances and handed out flyers to arriving students. Al Rebo received more votes than the rest of the the field combined! The result was tossed out and the student council faculty advisor (who happened to be my art teacher) ordered Tubbs and I to report to an asst. principal's office for a tongue lashing. But the guy couldn't keep a straight face and just waved us on our way. It was all great fun, but also another sad example of Dahmer's disconnect. He was the originator of the Rebo gag, but wasn't a participant in the subsequent antics.